There may be no more luscious way to please a crowd than these triple-chocolate truffle cups made with raspberry jam and sprinkles. Melt 2 Tbsp. butter; mix with cookie crumbs. Press onto bottoms of 24 miniature paper-lined muffin cups. Add 1/4 tsp. jam to each. Refrigerate until ready to use. Microwave white chocolate, 1/4 cup cream and 1 Tbsp. of the remaining butter in microwaveable bowl on HIGH 1 min. ; stir until chocolate is melted and mixture is well blended. Spoon over jam. Freeze 10 min. Meanwhile, melt semi-sweet chocolate with remaining cream and butter as directed for white chocolate. Spoon over white chocolate layers; top with sprinkles. Refrigerate 1 to 2 hours or until firm. 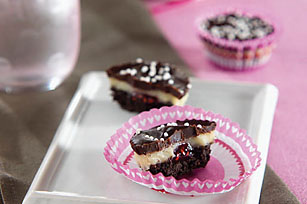 With their built-in portion control, these luscious truffle cups make great treats. For variety, substitute marshmallow cream, peanut butter, caramel sauce or a different flavor of jam for the raspberry jam in the recipe. Melt additional 1 oz. BAKER'S White Chocolate as directed on package. Drizzle over truffle cups before topping with sprinkles. Makes 2 doz. or 24 servings.